Salt water is not just for the beach anymore! While chlorine pools have long been the most popular option for keeping your water sanitary, they are not the only option. Salt water is a great pool water alternative, and the experts at Sunrise Premiere Pool Builders are here to tell you why. The salt water in a salt water pool facilitates the consistent renewal of chlorine to keep your water clean. Typical chlorine pools need to have chlorine added periodically to maintain their levels of cleanliness, but salt water allows chlorine to constantly flow into the pool. While a salt water pool is, consequently, not chemical-free, it still does require lower levels of chemicals to stay clean and because it stays clean longer, you do not have to invest in expensive pool cleaning systems as frequently. Clean salt water pools help deter the growth of bacteria and viruses in the water, meaning your pool will be a healthy place to swim. A salt water pool can have an additional benefit outside of the enjoyment you and your family will get out of it. 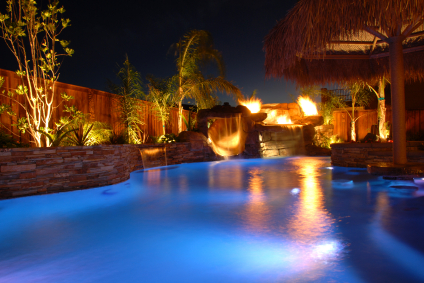 A pool can instantly add property value to your home. Many homeowners today are seeking extra features such as pools when they go house hunting, and if your home is on the market, it will be sure to stand out. An innovative, unique feature like a salt water pool will be even more eye-catching. Do you have any additional questions about the benefits and advantages of a salt water pool? Call on the experts at Sunrise Premiere Pool Builders today for more information. This entry was posted on Monday, February 3rd, 2014 at 4:52 pm. Both comments and pings are currently closed.